If you are looking for a basic email marketing service to just send emails and capture subscribers, then Express Pigeon is Perfect. They offer dozens of quality templates and an incredibly easy to use editor. Express Pigeon targets beginners and users who focus on pulling off a non-pretentious email marketing campaign on a tight budget. If you are a novice in the email marketing world, Express Pigeon is a sensible option. Apart from the usual email marketing solutions, such as templates and a drag and drop editor, Express Pigeon also offers some interesting integrations, like google analytics, Shopify, Hubspot, facebook, Youtube and many ther online services via Zapier. While this allows for greater flexibility, you can expect further charges to be applied by these third parties. Take a closer look at what Express Pigeon has to offer. Template Selection – The template selection is quite scarce, with only a few dozen templates to choose from. They are not categorized in any way, and are quite similar to each other, so choosing a template can be a hassle if you’re inexperienced. The templates only serve to give you somewhere more colorful to add your text, photos and brand logo. Customization – Express Pigeon has made it fool proof to customize your templates in a matter of minutes. After you choose your theme, you can edit colors, change your text and upload photos. The designer uses a simple drag and drop feature to easily change your layout, fonts, background colors etc. Express Pigeon also provides a tool to edit templates in HTML or iFrame. Again, it’s a basic editor, offering substantial tools for creating great starter emails. Multimedia – Express Pigeon offers no free stock photos but does give users unlimited media storage space for uploading their own photos. It is very easy to upload or drag & drop images into the template builder. However, that is the only media interactive you can expect to find here. If you’re looking for the most basic email marketing app, then this is the service for you, otherwise we suggest taking up a more robust email marketing service. Express Pigeon do a good job of providing a simple to use platform that is free from any clutter or confusion. As the platform only caters towards the beginner end of the market you wont be lumbered with an excess of tools that may get in the way. Instead, you will have a simple and easy to use editor with basic features that will allow anyone to get started in no time. One big advantage is that you can change your template theme right from inside the editor. There is no need to switch back and forth between pages. Plus, you can make any adjustments to the HTML or iframes directly from inside the editor. The support is quite weak. 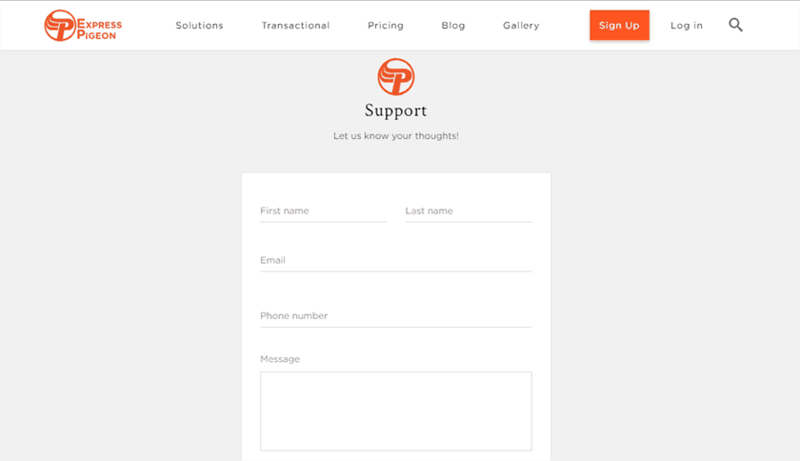 If you have a question or request, you can submit it in their “support form”. There’s an email listed on the Facebook fan page, but nowhere on the site can you find how to contact customer support. There is a blog that provides marketing tips to create an email campaign, and tutorial videos on the template builder itself. That is. however, the only help you’ll be getting. Free for lifetime that allows you to send 1,000 emails a month to up to 500 subscribers. 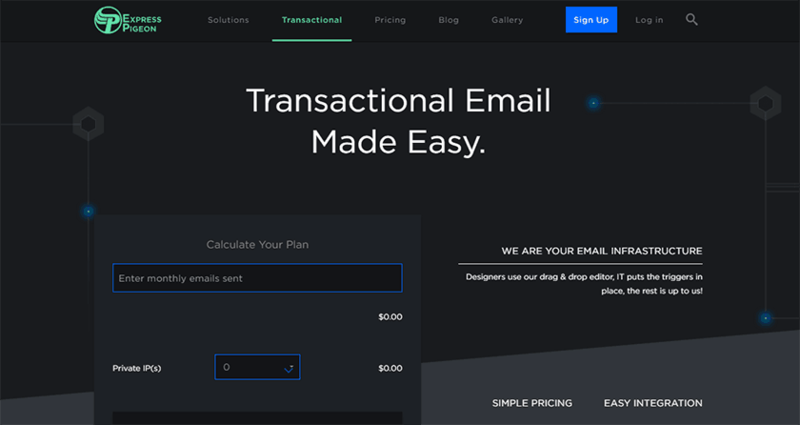 A pricing package based on list size, allowing you to send unlimited emails every month. They also have plenty of options for enterprise level clients who are seeking more than just an email marketing solution, with integrated CRM’s and other cool features that help to boost sales, without the need for complex coding skills. At the end of the review, we can draw the conclusion that this service can be great for beginners. However, once you reach for your wallet, we recommend choosing an option that will provide more value for the same price. Barbara is an expert in Performance Marketing. She leads WebsitePlanet PPC and SEO teams, and she mentors SMBs on the use of Search Advertising as well as Social Marketing.